While Torontonians are used to dealing with pigeons and pesky raccoons, a local couple was given a shock recently when they found an unwanted house guest living in their walls: a python. Janet Wilkinson, who lives with her husband Chris Forde, said she first spotted the serpent as the couple worked on renovations in their east-end home. 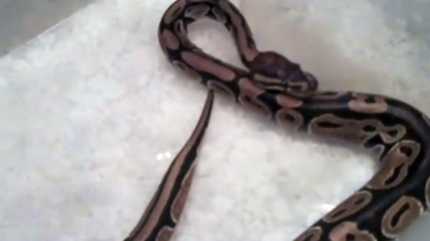 While the snake seemed to disappear shortly after that first visit, Forde decided to document the snake search and upload the videos to YouTube. For around five weeks, the couple looked for the snake, even using heating pads in a vain attempt to lure the creature out of the walls in the home, located near Danforth and Coxwell Avenues on the city's east end. "We did a million things, like bait him with dead mice and rats," Wilkinson says on one of the YouTube clips. But the snake was nowhere to be found. But late last month, as Wilkinson went to her basement to get some drinks from the couple's beer fridge, she was greeted by the python. Nearly in a state of shock, she screamed and her husband quickly bounded down the stairs. The quick-thinking Forde used a piece of wood to pin the snake, which amiably slithered into captivity. "I'm all shaking but we just captured him!" said Wilkinson in one of the videos. "He's beautiful now that he's in a box," she said. "I can feel sympathy for him." Despite the appreciation of the snake's charms, the couple soon sent the animal to a local pet store, where such pythons are popular as pets. Now, however, the couple believes that there may be a family of snakes in the home, as yet another was found: this time, it was in the washing machine. "There's three or four in the family," Wilkinson told The Toronto Star this week. "I'm sure of it." The couple's snake case isn't alone, either. Last week, tenants in a downtown high-rise were given a scare when an Albino California King Snake escaped and went on the loose. It's believed the snake is still hiding somewhere in the building.